This was my (second place) entry for the 2013 Forgotten Spaces competition. A project organised by the RIBA (Royal Institute of British Architects) and the Architects’ Journal, in conjunction with local government, to generate bold ideas for the reuse and redevelopment of "redundant and neglected spaces" across the city. In this instance, that city was Preston. A small municipality in the North West of England. Applicants were asked to choose from six potential sites and submit a proposal that responded, generally, to the local context and the needs of the community. Submissions were then assessed by a distinguished panel of judges (including the then president of the RIBA, Stephen Hodder), with the winning entrants put on public exhibition and included within national publications. Growing up with Preston as my closest city, I was aware that the "needs" of some of the communities there - especially in those areas surrounding the six potential sites - were particularly desperate and should be considered at the forefront of my approach. Subsequently, I decided to undertake a somewhat objective and quantitative study of publicly held data in order to identify, first of all, where those needs were greatest and secondly, what it was they consisted of. From this, I selected a 1970’s multi-storey car park located at the epicentre of two particularly deprived areas, which enabled, through its unique size and unorthodox materiality, a profound potential for reuse and with that a possible improvement to local living conditions. Focusing on those key qualities of deprivation least constrained by wider socio-economic conditions, I engineered a programmatic response deemed capable of alleviating them. This was an “urban farm” and “agricultural workshop”. A custom program incorporating a diverse range of vegetative farming methods (both old and new), capable of merging with the existing supply chains in the area, educating local community groups and invigorating the local environment with functional flora and life in general. My design response sought to express this novel repurposing of a typically rural program, by incorporating the decontextualized architectural typologies of conventional agriculture into the existing mass of the car park. At once expressing, symbolically, the functionality of this contemporary redevelopment, while modifying the existing form to suit the necessary environmental conditions required, such as natural light (and plenty of it). 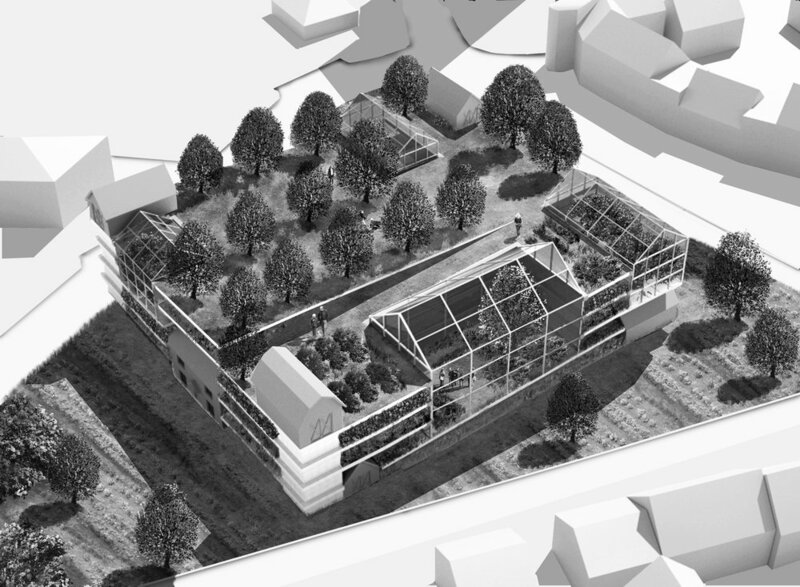 This playful reinvention of the traditional farming estate, combined a post-modern aesthetic, responding to both a regional and global agricultural context, with a typically modernist resolution to mounting concerns over conventional farming methods – making not “streets-in-the-sky” but “crops-in-the-sky”. The final form, host to a plethora of agricultural practices (from potato farming and composting, to beekeeping and aquaponics), incorporated a “pick-your-own” supermarket, an education centre and an “allotment hub” for local residents. Incidentally, this architectural intervention also presented a transferable typology capable of dealing with similar social concerns and similarly out-dated parking structures present all across the U.K.